Greetings! I am Primid. Welcome to the Musical Melodyian webular portal - primary channel of Melodyian MUSIC, comics, videos, and media Transmissions. we eat music and are stimulated by social interactions. please commune with OUR FACEBOOK, Patreon, SOUNDCLOUD, YouTube, INSTAGRAM, BANDCAMP, Thingiverse, and Instructables. We hope our resonances bring you much cosmic harmony. thank you! Please enjoy the soothing resonances enclosed in this interstellar Melodyian transmission as a humble gift from our kind to yours. Resonate your Inner Senka and unlock the secrets of the cosmos. Latest page - the saga continues! Resonate your corpus with the newest Melodyian music transmission, featuring soothing soundscapes, binaural beats and ambisonic surround. Listen on headphones for the full immersive experience! Our resonances have been engineered to entrain human brainwaves to a relaxed state, and are well-suited for meditation and mindful listening. Thank you for supporting interstellar music! 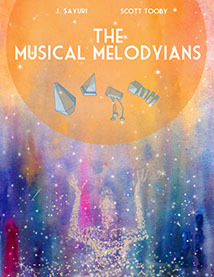 What the #@$% is a Musical Melodyian? Who are we? What the zandor is a Patreon? I must know how to support these cosmic vibrations! I must become a noble patron of the interstellar arts! Attention Earth: Our music has landed! Listen to our debut EP and expose your ears to new alien musics, cosmic soundscapes, and never-before-heard sonic secrets of the universe! It may take a few minutes to acclimate to our interstellar sounds, but don't worry, it's a natural reaction to the galactic audio entrainment process. If your auditory organs are particularly energized by our resonances, you can buy our EP on Bandcamp. Thank you for supporting interstellar musical relations! Enclosed in this musical transmission is a sonic collaboration between the Melodyians and their space whale friends - the Baleeans. Greetings Earth: Please enjoy this interstellar musical transmission for your aural health and well being. We will maintain this open communication channel well into the future as we continue our broadcasts. Thank you for your kind attention to this matter. Musical aliens. Space whales. Interspecies love. Need we say more? 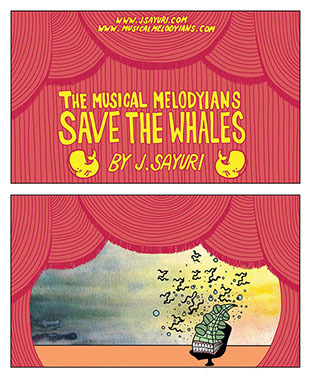 Explore an alternate side of the Melodyian universe in this spin-off comic by artist and comic book creator J. Sayuri. Greetings human: I am Primid, the Honcho Minor of the Melodyian Music Magistracy. Enclosed in these photon transmissions is a critical message from Premiere Honcho Haar Vernaloo. Please relay this to the leaders of Earth immediately for decoding. It is of critical importance to the karmic balance of our two worlds that you are successful in this task. The very fate of all that is music hangs in the balance! I appreciate your urgent attention to this matter. Thank you! Greetings from Melodyia: As a sign of our good will towards humanity, please enjoy this peaceful dance of sacred ceremony. May the music of the cosmos resonate with you! Greetings curious explorer! 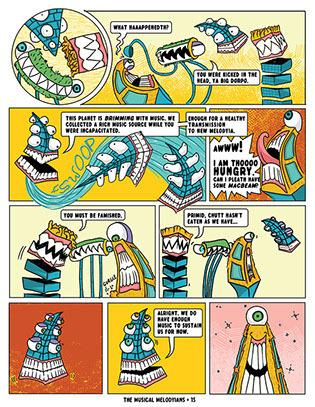 Are you intrigued by the inner-workings of Melodyian technology? Watch this short demo of the 3D-printed robot puppet synthesizers featured in Melodyian videos.